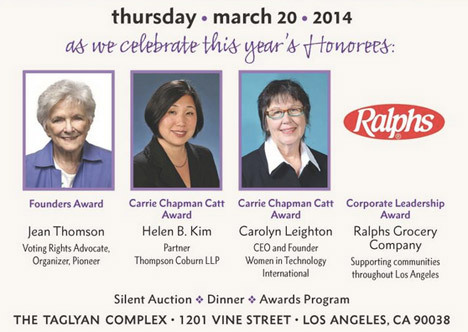 Join civic leaders, elected officials, community members, and dignitaries at the 2014 Celebrating Leadership Awards Dinner presented by the League of Women Voters of Los Angeles Education Fund. Many of us want to excel during our annual performance review or be nominated for that new position or promotion. However, delivering or even better yet over-delivering, on your projects is not always a guarantee for that acknowledgement or promotion. Read More | Register for JJ's next webinar! What a wonderful way to delve into the ideas around starting your own company! WITI Orange County hosted an event with the partnership of K5 Launch and an excellent panel of women entrepreneurs. In Defend Your Research: What Makes a Team Smarter? More Women, Thomas Malone, a management professor at MIT, created teams of people aged 18 to 60, had them take IQ tests, and then issued them a series of problem sets. Surprisingly, those with the highest IQs did not perform the best - but the teams with the most women, did. "The standard argument is that diversity is good and you should have both men and women in a group," he told the Harvard Business Review in June 2011. "But so far, the data show, the more women, the better." Have you ever felt frustrated that you entered into a "bad deal?" Do you feel intimidated or out of your comfort zone when negotiating? Would you like to feel comfortable, confident and in control when you negotiate?